“Are you bleeting?” he called in a loud, almost shrill voice as I stretched one arm higher, straighter, shakier toward a ceiling decorated with pastel-colored paper chains. “Bleet in,” he called, then half a minute later, “Bleet out.” The other six people in the room, finding solidarity in our self-imposed suffering, laughed at our drill instructor of a yogi as he finally released us from the pose and called the next: “Warrior three!” We adjusted our feet, and shifted back into position, the slightly sour smell of sweat airborne for another moment. Rwandans, like many East-Asian language speakers, don’t differentiate between /L/ and /R/ pronunciation, and, like many, many non-native English learners, struggle to form the /th/ (for my IPA-fluent friends, /θ/) , resulting in “warrior three” sounding more like “wallior tree.” I paused, glanced at the teacher and the other students, and found my way into the correct position. 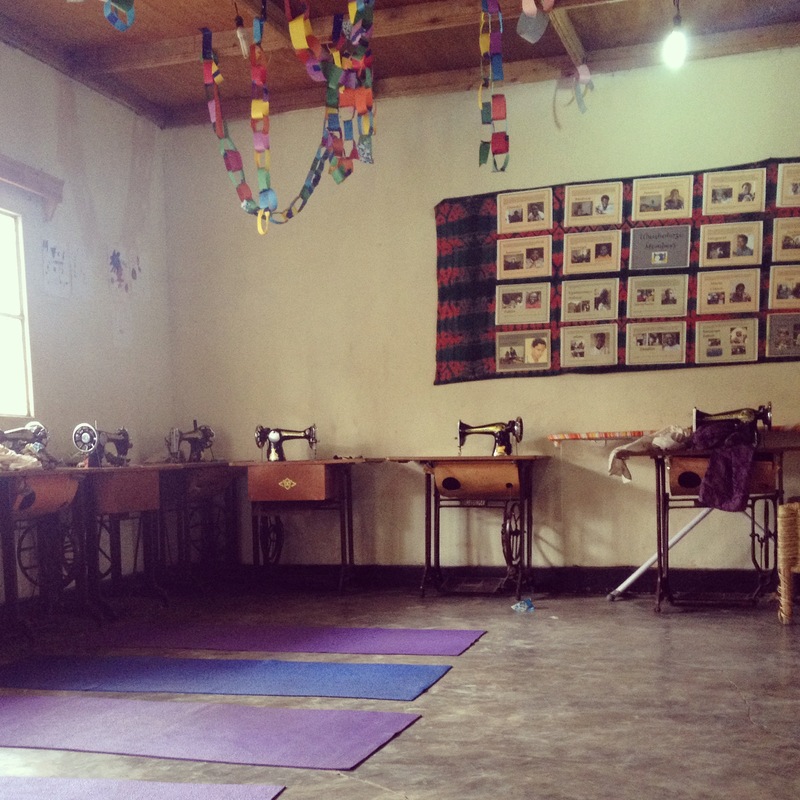 Yoga in Rwanda, born out of a chaotic globalized chain. The Rwandan man leading the day’s practice had been trained by Americans in Rwanda and Kenya, who had no doubt learned “second hand” from other Americans in the States. Somewhere, back in the history, the thousand-year practice had migrated to North America, and was now slowly making its way back to India, changed and adapted along the way. It gets even more complex here. 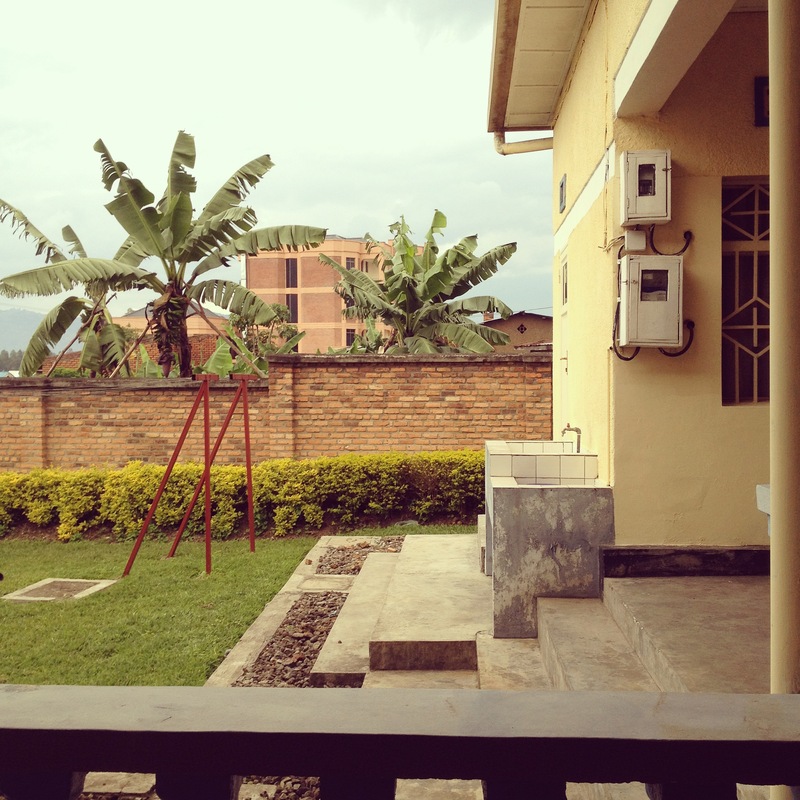 Today’s practice is hosted by a local women’s non-profit, a five minute walk from Musanze’s mosque. During the third down dog, I could hear the afternoon’s call to prayer echoing throughout the neighborhood, followed by the crack of thunder and the hammering of the three-thirty downpour. I’m not the most consistent practitioner of yoga. It isn’t a necessarily a spiritual practice for me, but a contemplative exercise. The challenge of holding postures, whether in a cool, burnished-orange painted studio in midtown Sacramento or on a sweat-soaked Bikram-studio mat, focuses me like no other exercise can. I move into position, hold it, hold it, hold, it, fight back the urge to drop it, fight, fight, release. The group pressure of classes keep me from abandoning part way through, and I’ve gone through periods of relying on the practice for what seems like survival: manic practice of Hatha yoga after a particularly soul-crushing relationship, and, earlier this year, an almost daily obsession with Bikram yoga. At the end of 2013, I made an important decision. I had to leave my job. It was slowly destroying me, driving me further into bitterness and misery, and away from the goals that I had always wanted to achieve. I made the decision to leave, and started on a course to find my alternative, all while waiting in almost painful anticipation about the fellowship. Bikram, practiced every other day for five months, gave me a break from this constant strategizing, beating my body into submission with buckets of sweat the evidence of the effort. And now, here I am, almost ten months later. I left a job that could have become permanent with health benefits, a title, and office; I rented out my chic little house; I parked my car at my grandparents and packed two fifty pound bags and sat on airplanes and in airports for 36 hours to reach this place. All of this ripped through my mind as I sat down on the mat at Ubushobozi, soon erased as my muscles tightened and whined at me for putting through practice once again after a long time away. The practice is of yoga is extremely universal. It can be done by old and young since it asks you to start where you are and move forward- and both young and old gathered at Ubushobozi, named for the Kinyarwanda word that translates to “power.” The organization is a local non-profit collective, where at-risk teenage girls from surrounding villages, often with their very young children, are taught to sew, use computers, and speak English. They sell their beautiful wares to support the building and participants: kitenge bags and purses, woven baskets, screen-printed tee shirts. And, yoga classes on Thursdays at 3pm. The girls are all trained in yoga teaching, a practice that can be used as a form of post-traumatic therapy, as the organization reports. This is what I appreciate about this country: the versatility and flexibility of organizations, willing to try new things and seek new opportunities. 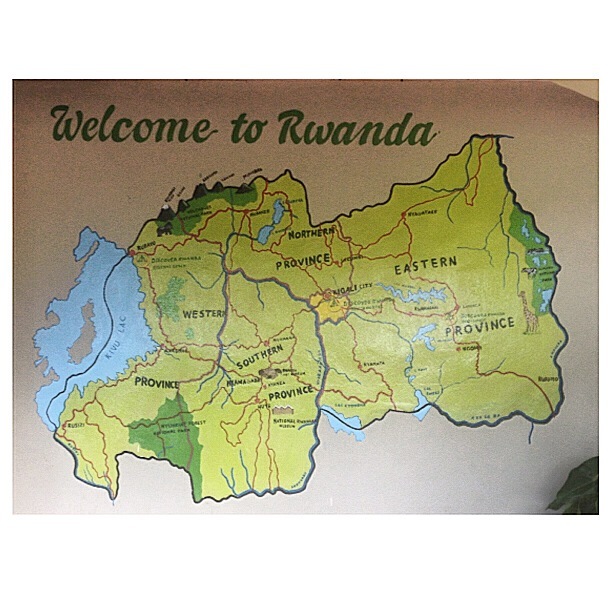 Today, Rwandans join my American friend, Erin, and I on the mat. One is a teacher for the program, others probable participants. They know the poses, they understand the point. We all bleet and strain and laugh at our incompetence together. I am reminded that this is a Rwandan take on a very old practice: the young children cry and play and practice their own poses in the corner of the room, rain spatters in through the open window, a cell phone rings for thirty seconds during the final pose, the “corpse pose” or shavasana, when you are meant to lie completely still, allowing your blood flow to calm and your body to relax. I can see the Lululemon yogis of midtown cringing at the noise breaking this silence, but all I can do is laugh. This is pretty perfect. An old, new practice for a new, new life. 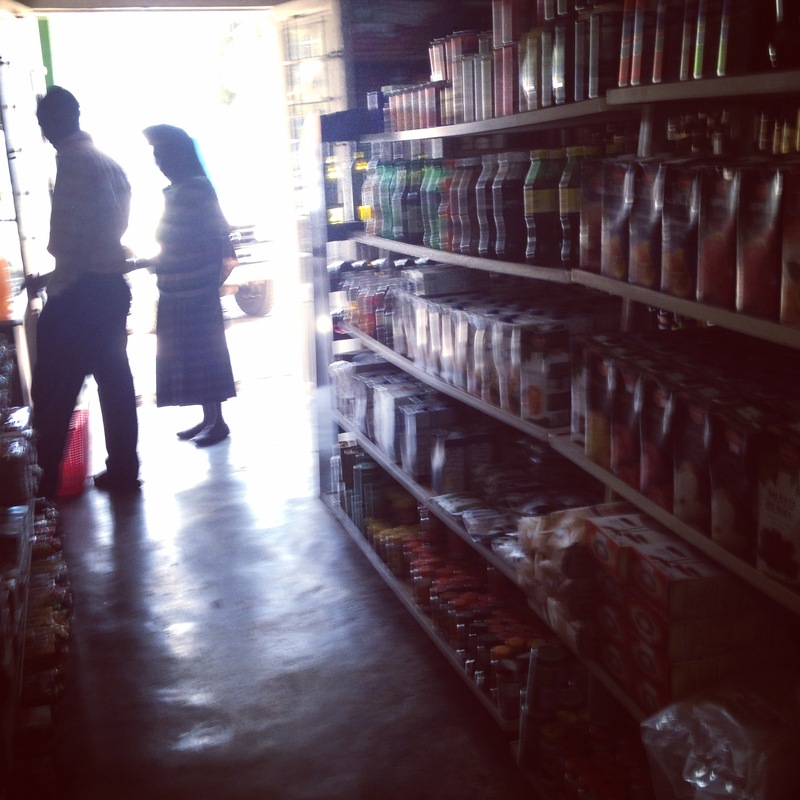 Musanze doesn’t have a Western-style supermarket, with sections for grocery and deli and dry goods, all presented on clearly marked shelves in a fluorescent, air-conditioned environment. Instead, there are a series of shops with a random selection of dry goods (which are different at each location and typically change every time you go) and the main market. 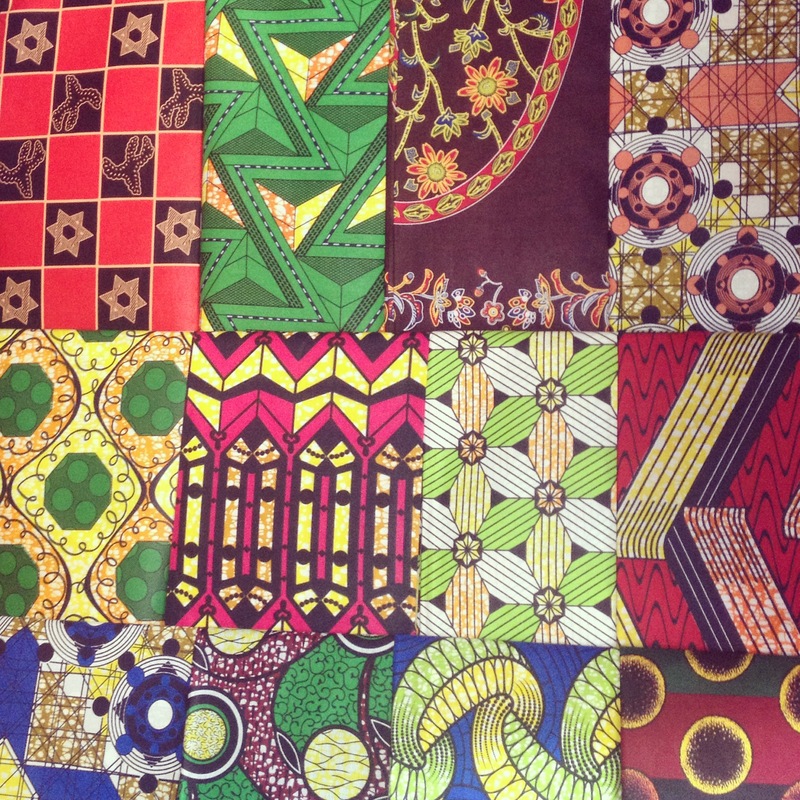 At the shops, I’ve learned an essential lesson about African shopping: DON’T THINK JUST BUY. Cans of coconut milk? Maybe you could make curry? BUY IT. It might not be there when you come back. Remember- there’s only the certainty of uncertainty, and that means that the shop’s pipeline of North African coconut milk could dry up at any time. 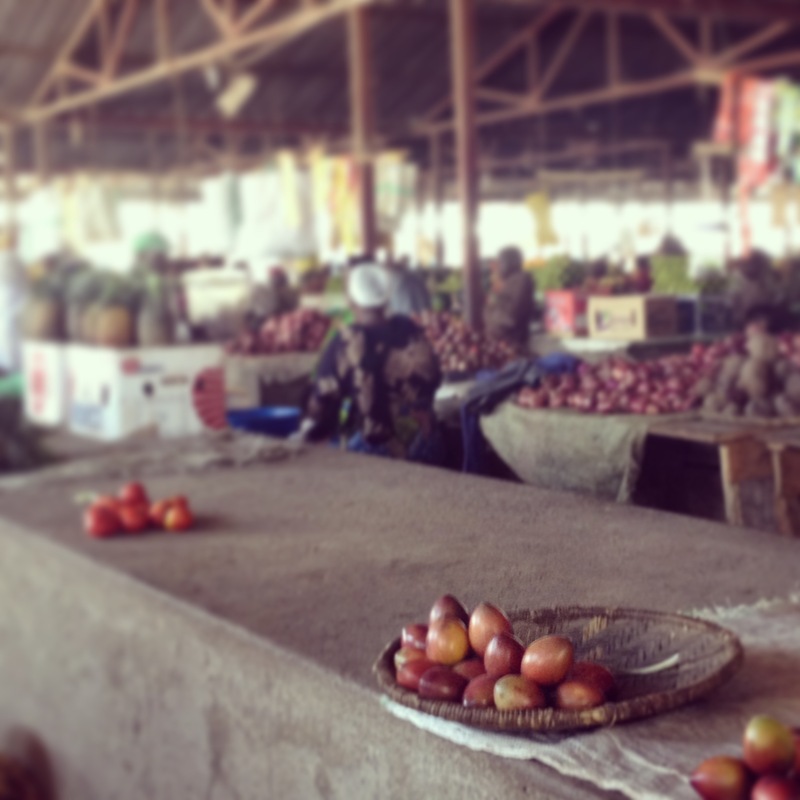 Fruits, vegetables, beans, eggs, fabric, cooking oil… these items can be bought at the main market, the prehistoric predecessor of Safeway and Tesco. In Musanze, this is a an open area dominated by a wide A-frame structure, that gets almost too dark to navigate on stormy afternoons. Around the main market are stalls and booths, every inch of wall space hung and stocked with good. Clothing sellers pile their wares on the ground on mats. Remember all the clothes that you donated to Goodwill or other charities for distribution to the poor in Africa? Here is where they end up, a part of a globalized second-hand supply chain. 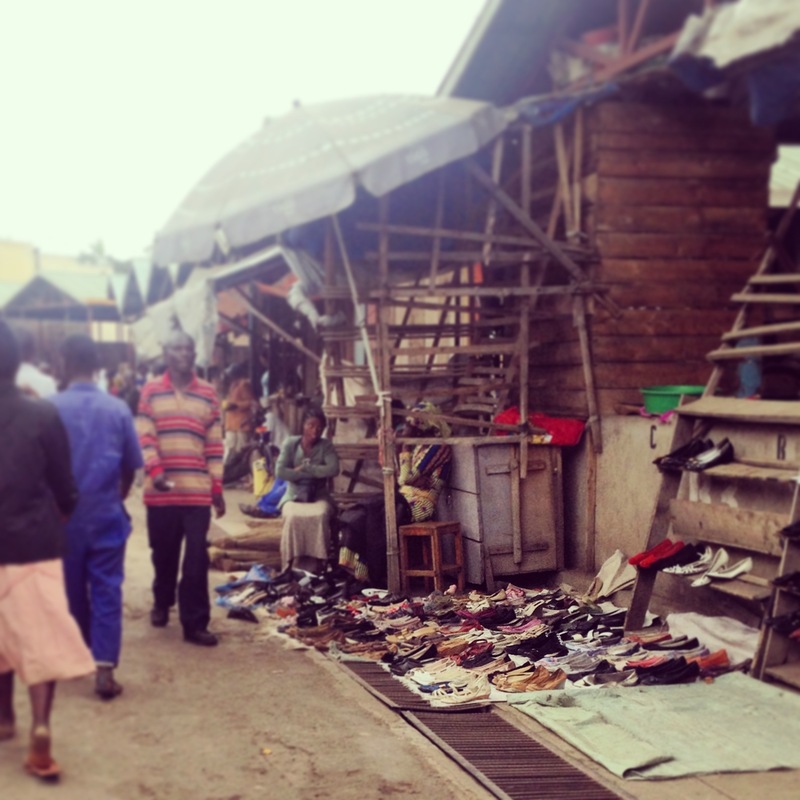 Shoes for sale – the size you see is the size they have! The market itself brings a little more joy, with row after row of long stalls, broken up by narrow walkways. The fruit and vegetable vendors stack their goods in neat piles, little pyramids of tomatoes and passion fruits, onions tied like flower bouquets. It’s an organic dream: everything from the surrounding areas, as farm-to-fork as humanly possible. Even the method of transport would put Sacramento’s festival to shame: no trucks here. Everyday, you see your vegetables make their way to market, wrapped in massive bags and carried on someone’s head, bike, or moto. 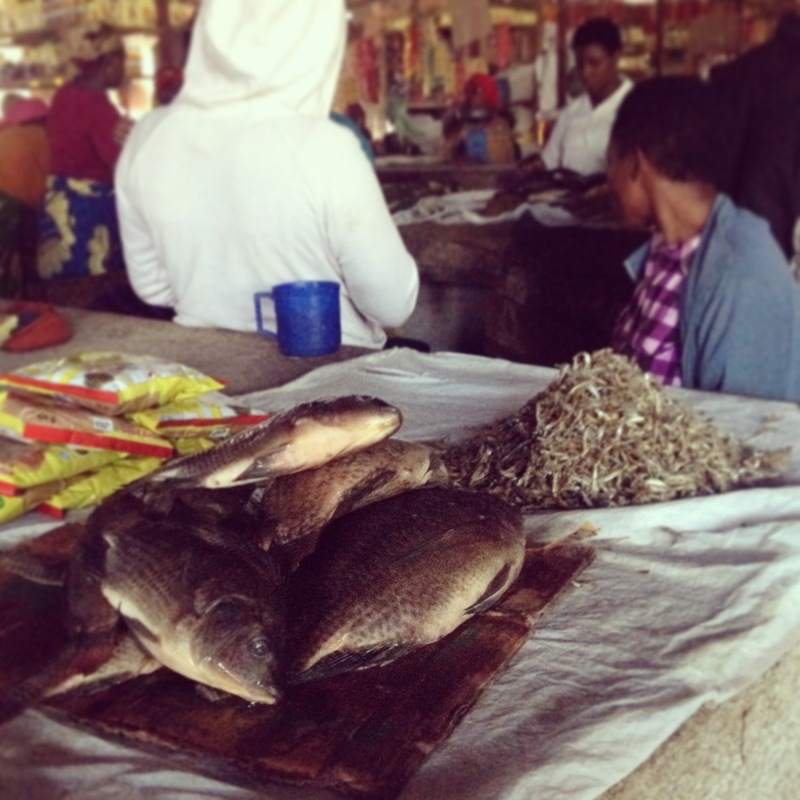 Here are a few common offerings, staples to the Musanze diet. On an early visit, I met a young man named Yasigue (not pictured), who (like many others) saw me and decided to try out his English. 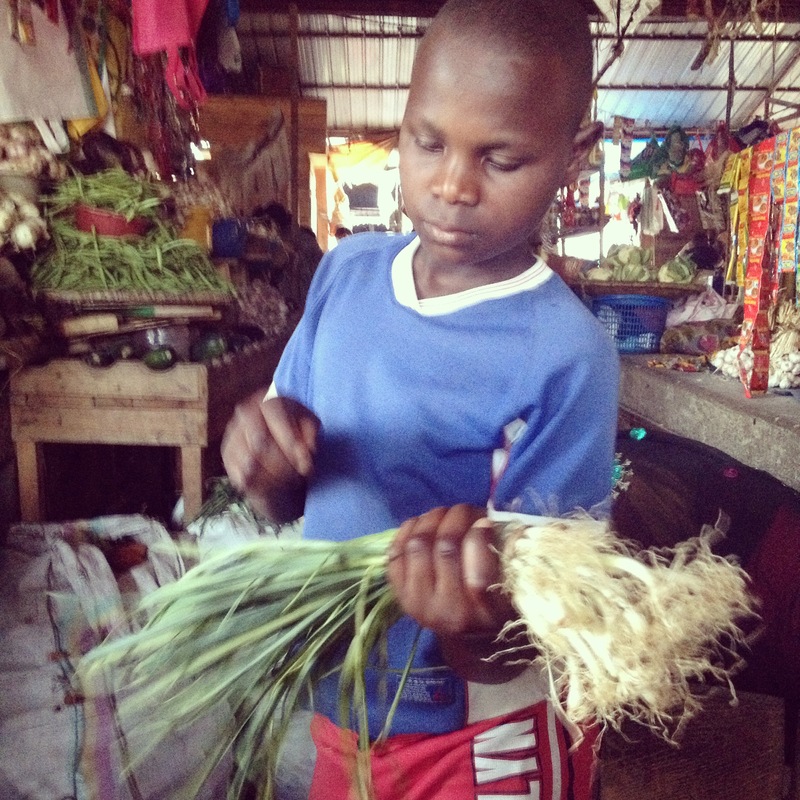 He’s seventeen and works at the market to earn enough to live on- he dropped out of school several years ago. Despite this, his English is impressive. Now, every time I walk in to the market area, he appears by my side to shake my hand, practice saying my name, and ask what I would like to buy today. We go through the market and he haggles with the sellers, telling me to get these avocados or to avoid those bananas too expensive. 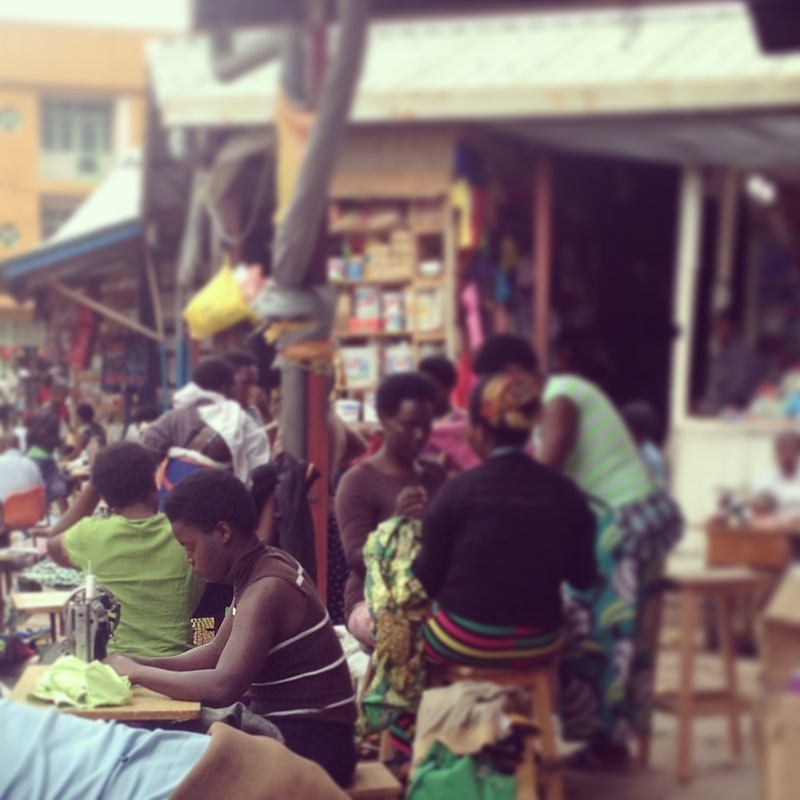 At the market, you will find another staple of African life: cloth sellers and seamstresses, with their pedal-operated machines set up in front of stalls. Sometimes they are sewing bright kitenge fabric into dresses and skirts, or tailoring second-hand clothes for their clients. The kitenge sellers have their fabrics folded and scaffolded up the walls of their stalls. They show me the prices typed out of their cell phones. As an outsider, I am walled off from the secondary function of the market: the spread of news and information, conducting all around me in Kinyarwanda. There’s an interesting dynamic, a cooperation between sellers. 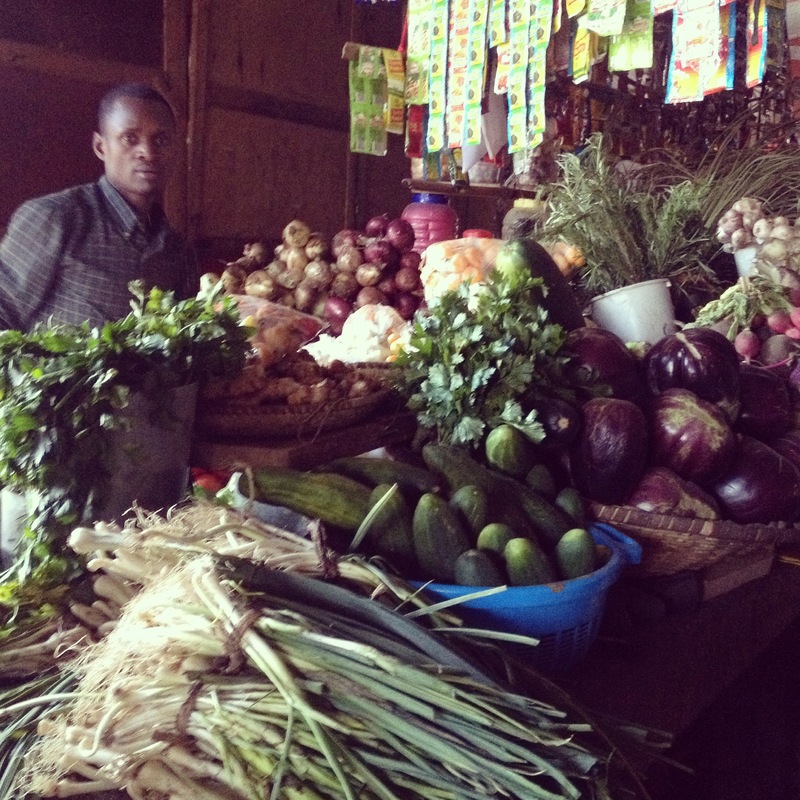 When you hand one a large bill (the ATMs and cash exchanges invariably dispense 5000 Rwandan Franc bills, about $7.50, and four avocados cost 400RWF, or $.60), they will move around to their fellow sellers to get the needed change. A system of fairness seems to operate, and not as much competition as you would expect. There’s little haggling, and I seem to get fair prices throughout. While I miss the ease of a supermarket, and the silence of that shopping experience, this is a new world, a new way to connect to the community of people here. New for me, but as old as the communities themselves. I’m here in Rwanda to teach at a university, which is meant to fill 70% of my time, with teacher training and so-called “capacity development” occupying the remaining 30%. I’ve been here for three weeks now, and I still haven’t started classes. I got a preliminary schedule assigning me classes which start next weekend, but even those are tentative- no one is quite sure of enrollment numbers at the moment. The very apple-pie American within me tries to conceal my horror as the Head of Department tells me this. Is he serious, I wonder? How can that be possible? 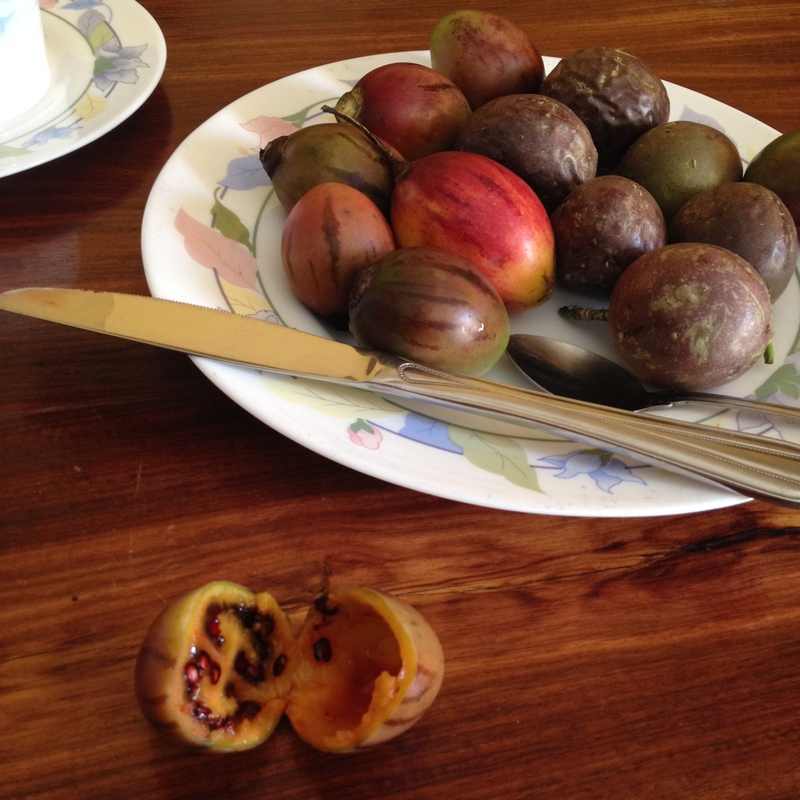 Though not my first run-in with what is called “polychronicity,” it was the first moment here in Rwanda when that strange stab of homesickness drove into my gut. Time, and the perception of it, informs so much of who we are, whether we realize it or not. 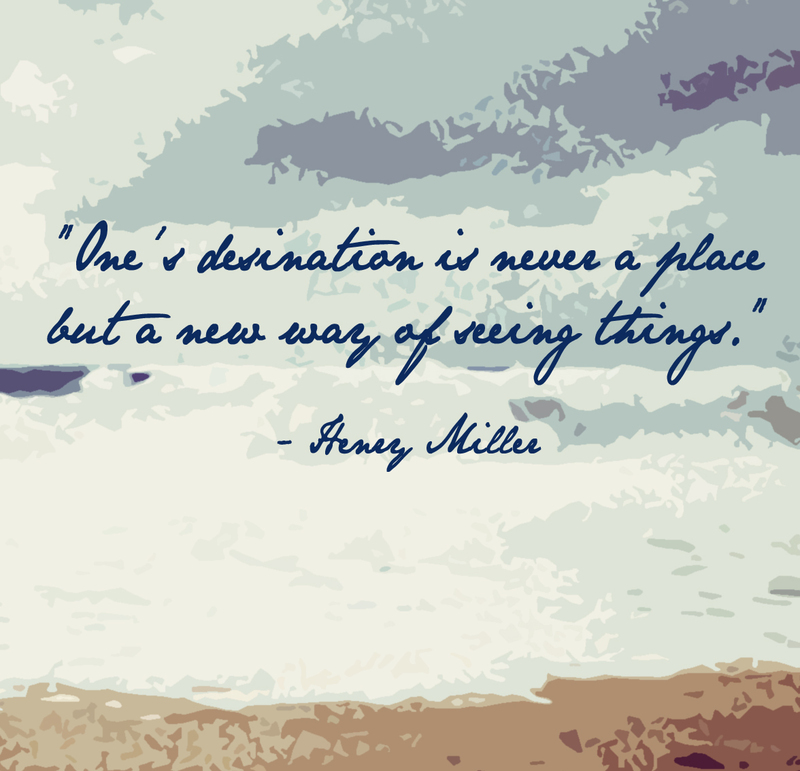 As humans, we have this innate desire to understand the world around us, so we observe and take apart whatever we can to get to that prized result: knowledge. We’ve perfected this with the Scientific Method, a process of making a hypothesis and working toward proving it to be true or false. And we love to categorize, don’t we? The late great anthropologist Edward T. Hall, also looking for something to categorize, dealt with intangible aspects of culture, including proxemics (physical distance between people) and perception of time. For all of overseas travel, I am still unchangingly, even painfully America when it comes to proxemics. My level of discomfort rises with each human body shoved closer to me in a train or bus, the worst example of which I can recall is from Ukraine, crushed into a tiny bus with my face literally shoved into the armpit of a very tall man. I needed two beers, a walk around the square, and five solid minutes of silence to recover from that one. More applicable to my experience here has been Hall’s conceptualization of time: monochronic vs. polychronic. People of a monochronic time culture, for example, view “time as money”; the quantity is finite and limited. Time moves in a linear direction- forward, until it ends and there is no more time. Consider a few American sayings. Literally, “well, time is money.” “I haven’t got time for that (or “ain’t nobody got time for that”). As a result, according to Hall, U.S. culture (like other monochronic cultures) “stresses adherence to preset schedules and completion of tasks over social relationships.” That seems a little bit harsh, but think about it. Take the example of a funeral: it has a start time and a time that it is expected to end. We have an expectation to revel in sadness or celebration, but there is an understanding that the time for that celebration is at least somewhat fixed. Polychronic, obviously, is the opposite. A polychronic culture “stresses involvement of people and completion of transactions rather than adherence to preset schedules. Appointments are not taken as seriously and, as a consequence, are frequently broken. For polychronic people, time is seldom experienced as ‘wasted,’ and is apt to be considered a point rather than a ribbon or a road” (Hall, 1983, p. 43). How neat and nice that seems, right? People are valued over business, time is of infinite quality, events are hours and hours of human interaction in building those essential relationships. Among my friends, we joke about our notions of time: Mexican time runs an hour behind white time, and Asian time finds itself somewhere in the middle. Whatever it is, polychronic cultures are different, and serve to frustrate Americans to no end. As a teacher, my schedule has become operational in my life. I need my teaching schedule to plan my life. I need my class times and dates- isn’t that how everyone operates? What have I learned? No. It’s not how everyone operates. And it’s not even necessarily the best way to operate. Without my schedule, I have thrown myself headfirst into what I can only call “hustling” – attempting to form connections, meet other people, and gather more information. My webbed network of educators, Americans, expats, students, and market ladies is slowly increasing, driven by my own uncertainty of what else to do with my time until I know my schedule. And while I may (or may not) begin my classes next Friday evening, I’m becoming better at wrapping my head around the uncertainty of it all- which has effectively become the only certainty I know. And that’s strangely comforting. When I arrived in Musanze, I was driven to my new home: what I have fondly nicknamed “the palatial mansion” for its massive, spreading heft. I feel so very colonial here; it’s a big house for me, especially given that my home back in the States is a little over 800 square feet. 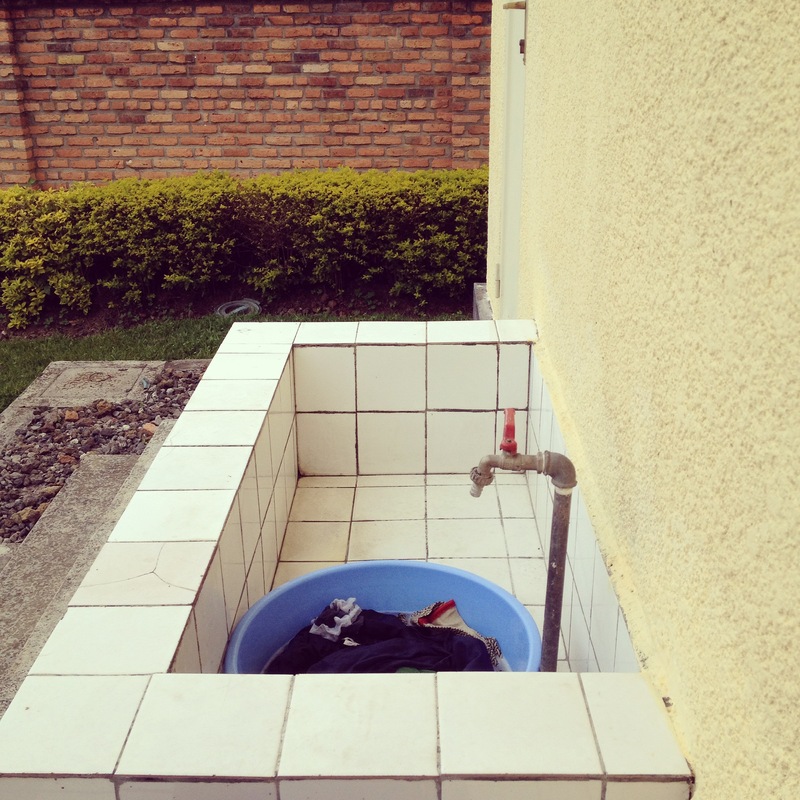 Here in Musanze, I live the high life in a three-bedroom cinderblock construction home, pretty typical to middle-class Rwanda, as far as I can gather. The outside was just repainted, and has a covered porch over the front door that looks out on the street. Since Musanze sits in the cradle of five volcanos, volcanic rock is everywhere- and makes up the crushed drive that surround the house within the gated compound. The house has a very typical guardhouse and broad metal gates which are kept locked. The guard is nearly always here to answer the gate and walk the property, helping to maintain the landscaping and help me burn trash (which is the disposal method). The floors are identical, ubiquitous tile; the walls are all a sunny shade of yellow, and all of the windows are covered both with privacy sheers and nearly as sheer curtains with floral or bubble patterns.Above each window are set bricks with an open pattern, covered with a screen to keep out the bugs. I’m not sure of the reason for this feature- perhaps to allow for airflow when the doors and windows are tightly shut. The Palatial Mansion has two “wings” – one with two bedrooms and a bathroom, the other with the master suite and another bathroom. The guest bedroom is decked out with the obligatory 80s-floral-chic bedding and mosquito net- needed not only to stave off the night-roaming malaria mosquito bites, but to keep them from buzzing in your ears. The bedframes are elaborate varnished wood, with numerous locking cabinets and padded seating at the foot. With cinderblock construction, you don’t have much ability to drill into the walls; hence they are bare, with cracks where the plaster has separated from the blocks. As I write, it’s clear that today is Saturday and neighborhood is out on the streets. Even as I sit at my table/desk, I can hear conversations of people passing by, motos honking friendly greetings at each other, the occasional Mack truck lumbering past that shudders my whole house. From behind, I can hear the thumping of bass (is that Beastie Boys? Fighting for their right to party?) across the street outside of my main windows, the daylong marathon that is the Seventh Day Adventist Church’s holy day schedule is in full swing, with a choir of voices raised toward heaven. I don’t mind either, but battling as they are, cacophony ensues. The power goes out twice, lights flickering and failing, fridge going silent, then springing back to life. 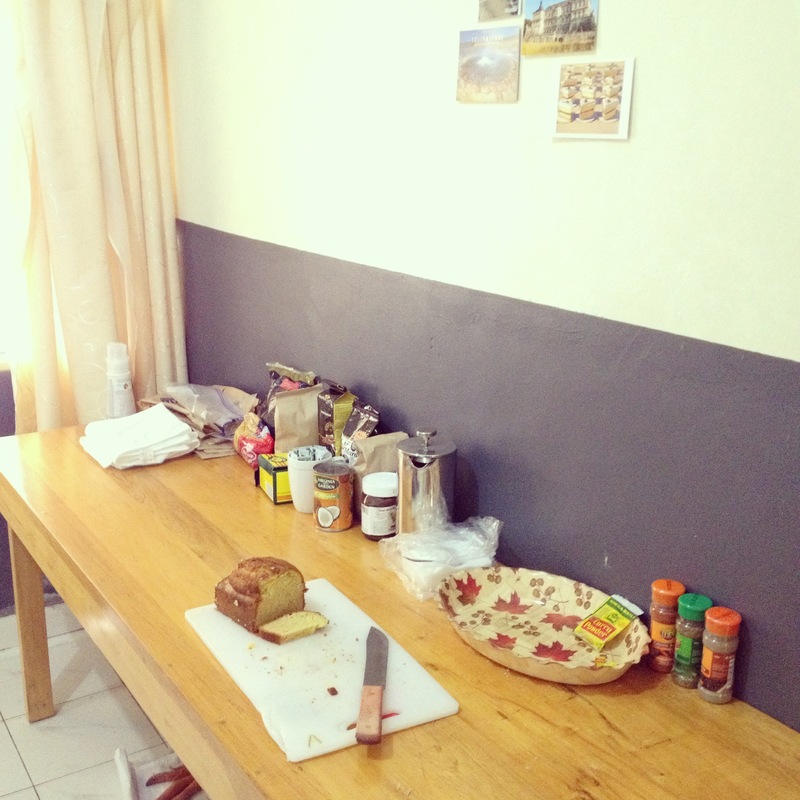 The kitchen is an open expanse with a sink console on one side and a low table, too low to chop anything comfortably along the other. The paint is chipping away from the concrete, returning to its natural gray. The kitchen leads out to the back area. My palace only occupies half of the building; a second, identical unit connects to my section. No one lives there now, and I might move there in a week to escape traffic noise. 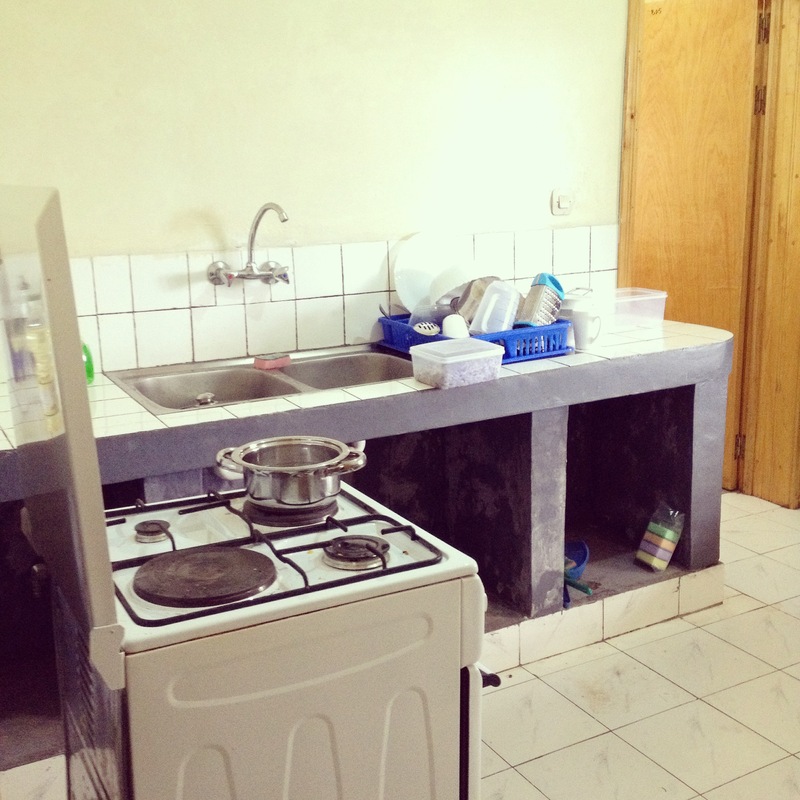 Note that it is also my laundry room: sink for washing clothes and line for hanging them to dry. And that’s the tour! More to come from the town and the university. 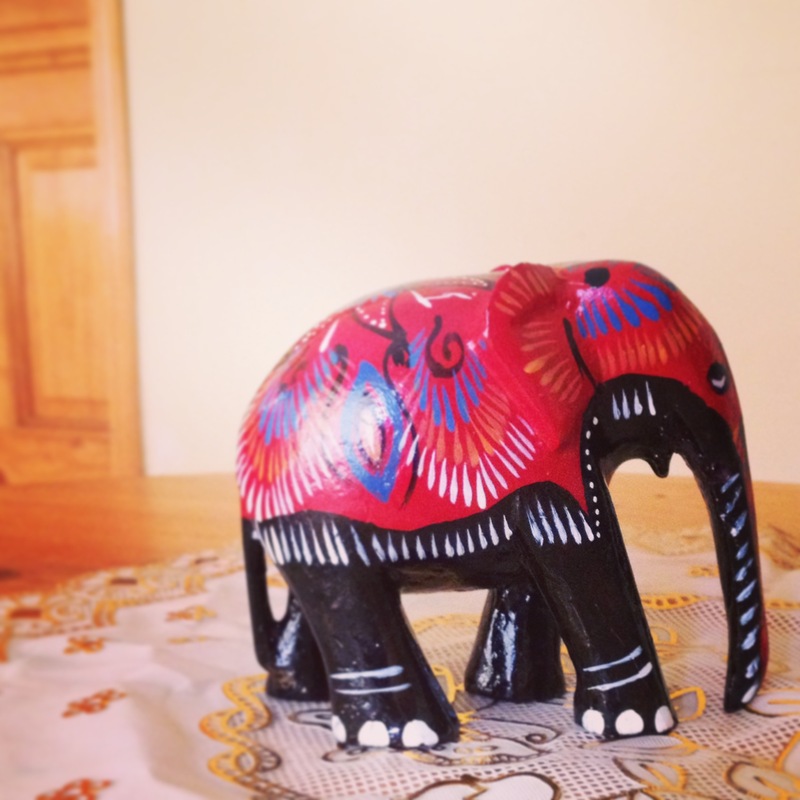 Love & peace from Musanze (and from my Sri Lankan lucky elephant)! This past week marked my entrance into my third decade (or as writers in pre-industrial England might term it, the beginning of my descent into elderly spinsterhood), and I went to the capital city, Kigali, to celebrate (and do a lot of other more boring things like buying a can opener and a new modem, but let’s stick with hey, PARTY!). Kigali is a fascinating place: like the rest of Rwanda, it’s a place of hills, with long, winding roads that cannot be transversed by foot unless you’ve got hours to spare, comfortable shoes, and the calves of a parkour champion. I came into the city on Wednesday and stayed until Saturday morning, spending time wandering through air-conditioned supermarkets (was my last visit to Safeway, that mecca of all things wonderful, really only two weeks ago? ), hiking up and down embassy row to visit my favorite American enclave with its foreboding fences and guard checkpoints, and eating food that 1) I did not cook and 2) had excessive amounts of “exotic” spices. Kigali is about 2 hours from Musanze, and I decided to take the least sketchy of the buses, the Virunga Experess, which I took to Gisenyi last weekend. It’s a standard bus, not like the combi vans with twenty people smashed into ten seats and chickens strapped to the top. 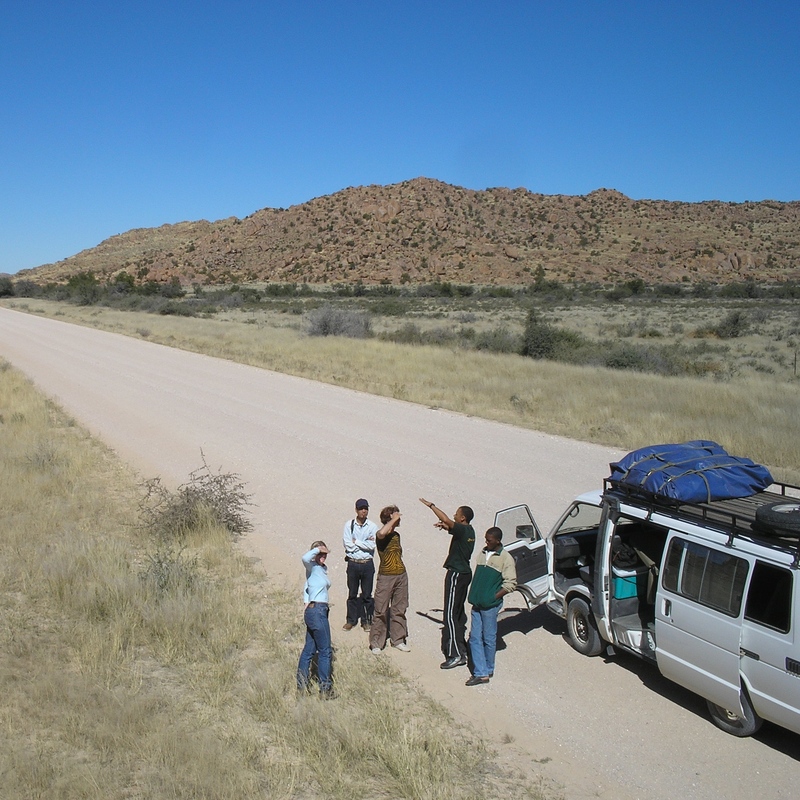 It was a step up from Namibia, where my travelmate and I took a combi van taxi for five painful hours, nearly sitting on the lap of a stranger and a young girl combing my hair. As for my time in the city, I’m somewhat shamed to admit that in my glee over the supermarket and other modern amenities, I didn’t do much sightseeing, saving the somber genocide memorial and presidential palace for another day. I was joined by other State Department contractees- the most famous Fulbrighters- for drinks and food at Zen (an “oriental kitchen”) on the night of my birthday. There I dried Dawa, an African cocktail whose name translates to “medicine” or “magic potion” in Swahili. It’s just lemon juice, vodka, and honey (let’s see that in a cough drop! ), but comes together to create a simultaneously bitter, sweet, and tangy drink. Going out to eat- at an Asian restaurant, no less- tends to be an activity of ex-pats, especially in African cities. Often, the expense of eating out and the unfamiliarity of exotic cuisine keep the locals to more known places- Rwandans favor buffets with a flat price and plates that are piled high with pasta, rice, cooked chicken, tomato and onion sauce, and a variety of fruits. We noticed a shift at Zen, though. Many outlets are reporting the growth of a middle class in Rwanda, one that can afford the expense of a meal out. The World Economic Forum reported that 1 million, or 12% of the Rwandan population, now fall into this category: those “who have been lifted from base poverty in the past decade and a half through government-driven initiatives.” Throughout Kigali, this is obvious, and perhaps more obvious that in Musanze. I stayed at Discover Rwanda Youth Hostel (as I cling to my own youth), an interesting place with filled with a variety of people, as hostels tend to be. The first night, I bunked in a dorm room with two UN Peacekeepers from Congo, headed to Uganda for vacation before going back to work at the end of October. I thought they were lovely until about three am, when they broke the cardinal rule of hostel etiquette and TURNED ON THE DORM ROOM LIGHT to pack and leave early for their bus. I was overcome by exhausted fury and too tired to complain as they zipped and unzipped their luggage, dumped everything on the floor and repacked (I assume), all while coughing very loudly. Thus, when my birthday morning with its bright 6am sunlight broke, I was a 30-year old zombie, sitting and waiting for the complimentary breakfast and life-giving coffee. The hostel improved from there. I met a South Africa-English woman (dual passport holder) who was headed to Musanze to visit several craft areas for her business, an import shop in London that sold fair-trade arts and crafts. Coincidence would have that she was headed for Ubushobozi, a place I visited earlier in the week when I heard they offered yoga classes (starting next week!). We chatted for a while and braved the bus back together, our luggage causing a stir with the locals. So I returned to Musanze, now 30: older, wiser, more likely to choose the single room option at a hostel, and more likely to pair tea ingredients (honey and lemon) with vodka. May the next year be even more of an adventure- but preferably with fewer Congolese Peacekeepers! Do me a favor, my Western-world-inhabiting readers. Go to your water tap and turn the red-dot dial (though, for my California readers, please put something underneath the tap to catch the water since you are in a drought and Shasta Lake is starting to look more like an archeological dig worthy of Indiana Jones). Revere the wondrous sight of its clean, giardia-free, crystalline cascade. Value the steam that comes off when it becomes warmer, the color shifting from clear to a white-hot stream. Know, in this moment, that I am jealously heaping old Yiddish curses upon you for your easy water access. Life in a developing nation is an exercise in consciousness. And not environmental consciousness as we are taught in the States, like my borderline-hippie kindergarten where we learned to recycle glass containers and use fabric grocery bags and transform egg cartons to make paper, which sadly did not change my life in the way that Mrs. Owings, my lovable fruitcake of a teacher no doubt hoped. I don’t write Kigali Grocery Lists on recycled egg-carton paper. Daily life consciousness in East Africa is (pardon the melodrama) Survival Consciousness. Life does not operate with the same amount of ease, and water is the easiest place to see this- and the area where I became conscious quickly. Lose this consciousness in your daily life and you risk a lovely host of parasites that are sure to turn your trip from exciting adventure to exciting adventures in developing world hospitals (the second least enjoyable site in Africa, after “prison”). My handy and frightening Lonely Planet Healthy Travel: Africa book (great reading pre-bed reading if insomnia is your goal) advises you avoid drinking straight tap water unless you are looking to contract gut infections, diarrhea, dysentery, hepatitis, and/or typhoid (p. 90). There are solutions for this, as any developing world inhabitant will tell you. 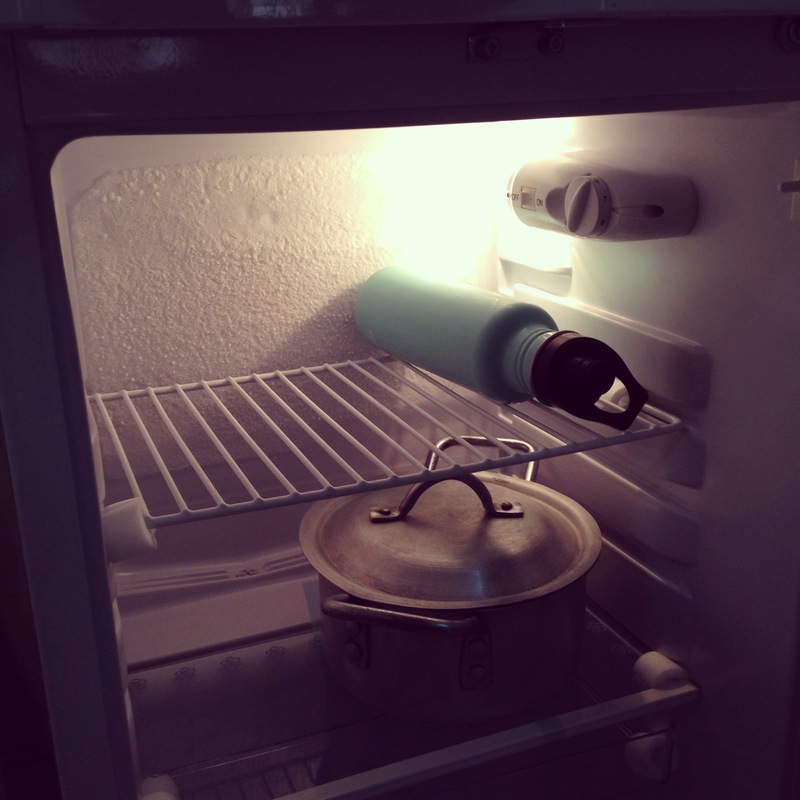 You can buy all of your water bottled and lug it back to your domicile (heavy, awkward, and starts to get expensive). You can pay for an expensive service to deliver filtered water to your home (very expensive). You can get an expensive filtering system for your home water pipes (expensive and I’m pretty sure no one should touch those pipes). Or, you can do what I do: develop a system for stocking water. 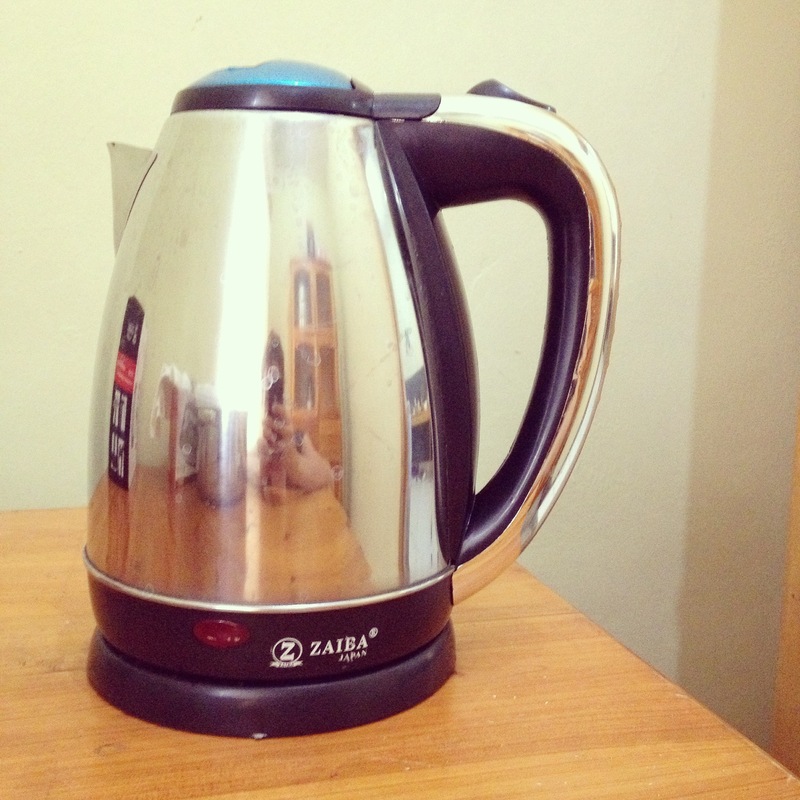 I wrote earlier about this most magical of kitchen appliances, the speed-kettle. Commonplace in every country except America, which I blame more on our lack of tea-culture, as I think quick hot water for tea is its primary function. Here’s my little beauty, complete with a selfie and peak into my kitchen closet with its fancy dish-housing cabinet. Every day, I boil multiple kettles of water. 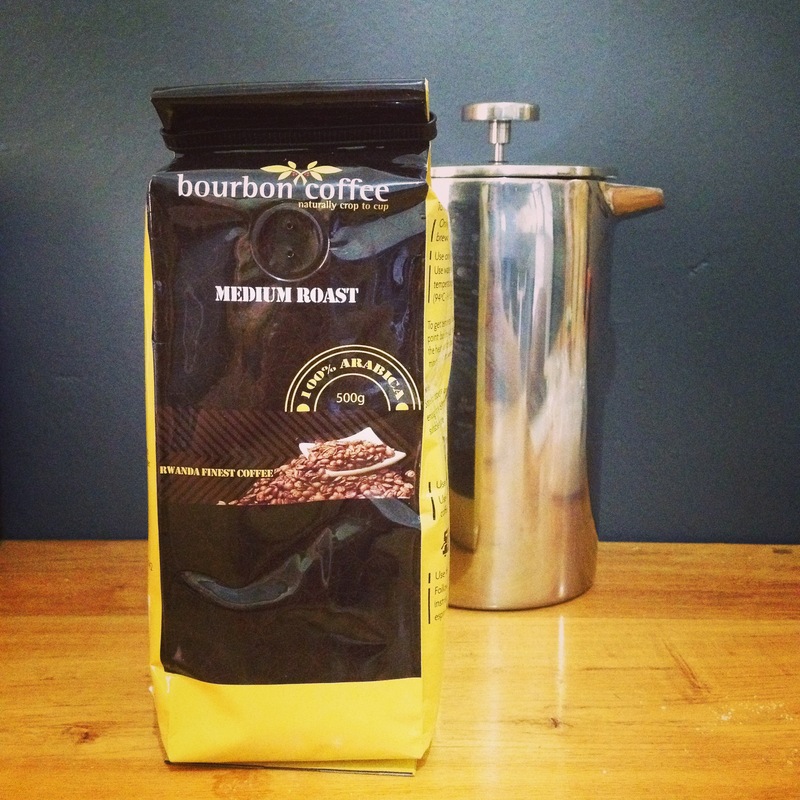 I boil a first kettle for making coffee with my French press and fresh Rwandan ground. After that, I boil another kettle and put it in one of the pots too cool- that typically takes a while. When it’s closer to room temperature, I pour it into one of several bottles, including a metal canister and some reused plastic bottles. Those go in the fridge. I use to go straight from the kettle to the metal canisters- and threw those in the otherwise empty freezer to speed up (“Americanize” & “innovate”) the process, but one overfilled canister left for too long became a third grade science reminder lesson: water expands when frozen. It can tear through cheap metal! So, thanks for the gift but I apologize for my gross misuse of it, English Language Programs! If I do laundry later, I use the kettle to boil a pot or two, which allows me to soak whites in hot water. All my washing is done by hand, in a wide bucket set into the outside sink. I let it soak, then rinse with more hot water, ring out, and hang to dry outside. When I shower, the kettle again fills up a pot or two. There’s no hot water in my house- did I mention that? 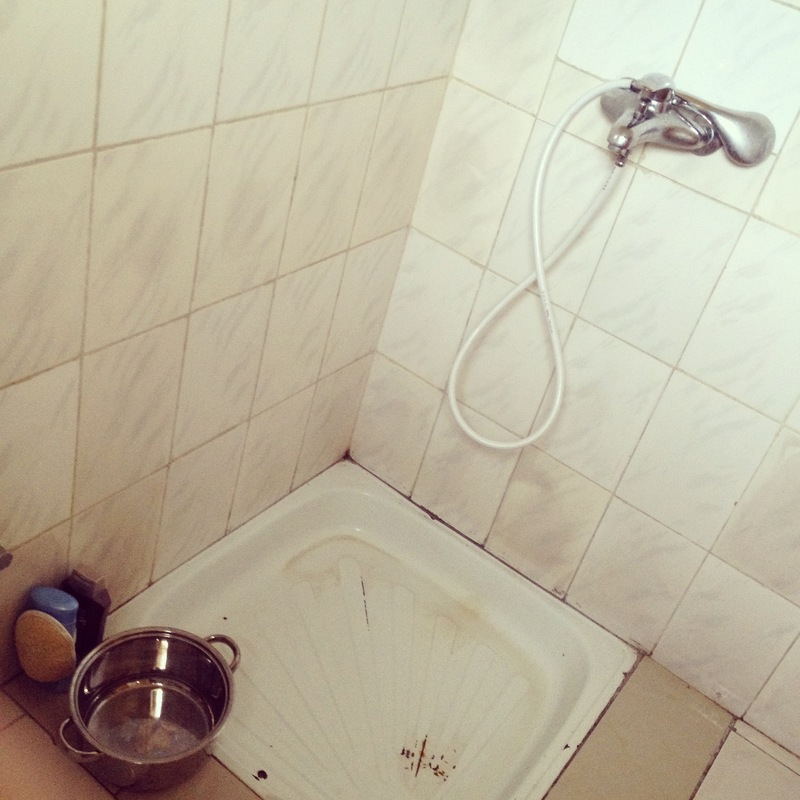 Half bucket/half ice tap water showers are the way to go. Mrs. Owings would be proud! Conservationism at its finest! Below? Yeah, that’s my shower. So there it is, my consciousness developed, my systems explained. It’s a reminder, as with everything else here, that life in the developed world moves faster not just because that’s how Americans/Europeans prefer life, but it’s the life that they have available to them. My method, though clumsy and time consuming, still beats daily trips to the well, a task which many African children, like many in Rwanda, are assigned for the well-being of their families. It’s hard to function on a basic level- to get to work, to go to school, to study, to cook, to eat, to see your family- when so much of life is taken with this survival-driven chore that is barely an afterthought in the developed world. The point of this isn’t to drive guilt. It’s just to remind you, and myself, that privilege finds its way into the most basic aspects of life. And as I boil my water for coffee in the morning, I realize that one thing I appreciate about this place is it causes me to slow down, to think, to begin each day with gratitude. And go turn off your tap. For now. Love & peace from Rwanda!